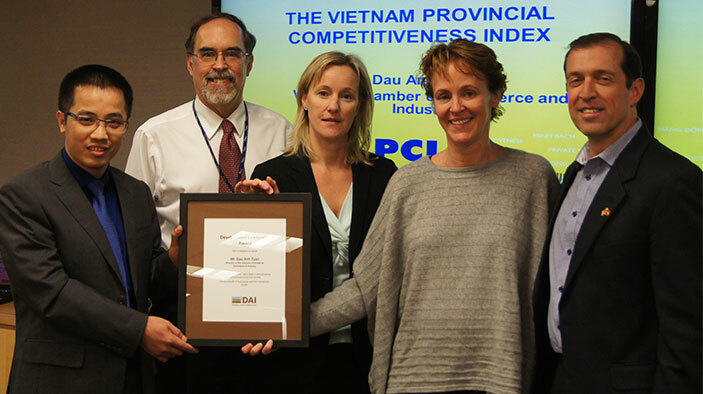 Since 2004, VCCI and DAI, in cooperation with The Asia Foundation from 2004 to 2008, worked hand-in-hand to create the groundbreaking Provincial Competitiveness Index (PCI). The index provides an annual measure of the business friendliness of the country’s 63 provinces and cities. The nine PCI indicators are tailored to the regulatory issues most pertinent to enterprises in Vietnam, providing a transparent, evidence-based ranking and analysis of the regulatory environment and economic governance. “The PCI report and findings that augment the voice of an average of 8,000 domestic enterprises and 2,000 foreign enterprises annually through the most comprehensive firm survey in the country are widely referenced in policy dialogue by the Prime Minister, the U.S. Ambassador, members of the National Assembly, ministers, provincial leaders, academics, bilateral and multilateral donor officials, and journalists,” said Dr. Winkler. The PCI is now solely managed by the VCCI through a USAID grant. According to Tuan, other government ministries have adapted the methodology to measure their own performance.